Think of early season professional cycling and most people think of Tour Down Under, which is held each year in mid January in and around the city of Adelaide. But there is another race which passes through some equally stunning countryside and has a much more rightful claim to be Australia’s longest running professional bike race, the Herald Sun Tour. Melbourne was recently voted the world’s most polite city and is regularly voted the world’s number one city in which to live. That’s not to say that Melbourne doesn’t have rivals, namely Sydney and Adelaide. Back in 1996 Melbourne secured, some would say stole, the Australian Formula One Grand Prix from Adelaide. One gets the feeling that Adelaide didn’t take this too well and was out for retribution. In some people’s eyes at least, mainly lazy journalists, is the view that Adelaide is simply Melbourne’s smaller cousin. The state of South Australia is a major investor in the Tour Down Under, the only UCI World Tour race in Australia. Granted the Tour Down Under is the better-known event, but the Herald Sun Tour is a gem of a race, the shrinking violet, the bridesmaid and not the bride. Rated by the UCI as a 2.1 stage race, the Herald Sun Tour is a third tier competitive event, open to UCI Continental and national teams. The race started back in 1952 and was won in true Aussie style by Keith Rowley, a sheep farmer from the rural town of Maffra. Keith beat his brother Max by 49 seconds to win with a time of 42hr 57min 55sec. At the back of the peloton, 19-year-old Roy Underwood, the youngest rider in the field, spent five of the six days arriving at the finishing towns in the dark. His father made a £50 bet with him that he would not finish. The Saturday stage saw a search party sent out to find him. After finishing the last day’s stage, his father handed him ten crisp £5 notes. The race’s total prize money was only £1,500 sponsored by the local newspaper. It is not unusual for newspapers to support cycling events with many European bike races connected to news media. A bike race is a great way to stimulate newspaper sales, think Tour de France, Giro de Italia, Het Volk, etc. The original Sun Tour was no different. Originally named the Sun Tour after the Sun News Pictorial, it changed its name to The Herald Sun Tour in 1990 when Melbourne’s local daily news paper, The Morning Herald, merged with the Sun News Pictorial. The race is owned and backed by the Herald Sun newspaper, Australia’s largest daily newspaper and part of the global News Limited Group. Rupert Murdoch’s interest in cycling keeps cropping up. The first Sun Tour in 1952 was the first professional stage race held in Victoria since the 1934 Centenary Thousand Classic. An estimated 500,000 people throughout Victoria saw the ‘Sun Tour’, as it was known then, pass along local roads. Of the 56 starters, only 18 finished the six-day event throughout Victoria. Sixty editions on and the Herald Sun Tour is now cemented as a significant event within the state of Victoria and its cycling heritage. With significant support from key sponsors, including caravan manufacture Jayco and the Victorian State Government, this iconic event now demands daily electronic and print news coverage as the stars of today and tomorrow go head to head in the battle for supremacy in Australia’s oldest stage race. The Herald Sun Tour became a part of the State Government hallmark events calendar in 2005, with an injection of State funding to support its growth and development. A major revamp including a new business plan, management team and enhanced world ranking has laid the foundation for strong growth with a dramatic increase in the number of riders and entourage, global media coverage (200 countries in 2007) and local coverage via TV and radio. The 2012 Tour de France champion, six-time world and Olympic champion Sir Bradley Wiggins won the tour in 2009, further highlighting the quality of riders required to win this prestigious event. After this win he stated “If I was going to pick a tour to win other than the Tour de France, the Jayco Herald Sun Tour is the one“. The race took a year off in 2010, during which Melbourne and Geelong hosted the UCI World Road Cycling Championships. Australia in January and February is becoming a mecca for professional continental cyclists. The attractions include a huge country with fabulous vistas, empty well surfaced roads and superb weather conditions making it a warm place to skip the northern hemisphere winter. Spectacular sunny beaches also help with the tan when not out on bike. The three major Australian summer cycling events are a good measure of warm weather training. Starting with the Tour Down Under (late January), it is followed closely by the newly established Cadel Evans Great Ocean Road Classic and the Herald Sun Tour as the finale in early February. These three events make for a great racing itinerary before returning to Europe for the Classics. 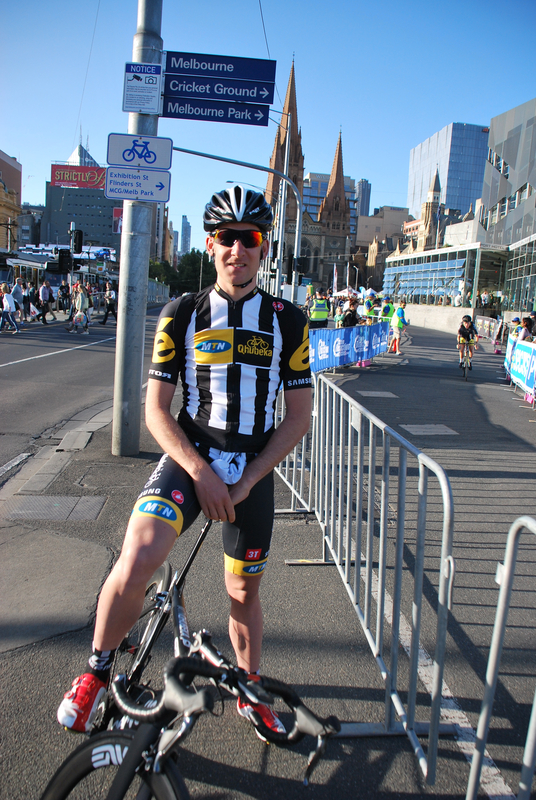 Continental Pro and former Irish National Road Champion, Matthew Brammier from team MTN Qhubeka after the prologue TT. To avoid the northern hemisphere winter, a large peloton of professional cyclists descend upon the old gold rush city of Bendigo, 150km north of Melbourne at the geographical center of the state of Victoria. Every morning large bunches of professional cyclists head into the hills around Bendigo with almost everyone ending up at The Old Green Bean Café for post ride coffee and analysis. 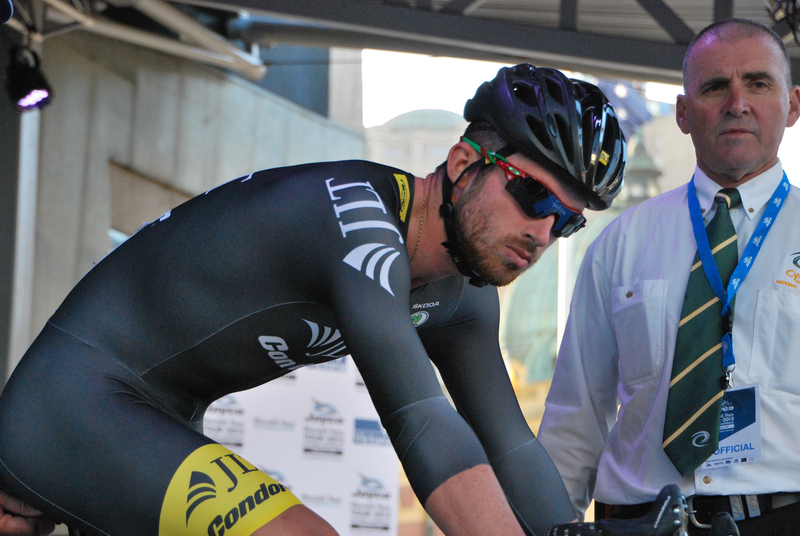 John Herety’s JTL Condor team has made this town their center of operations for the last few years. Julien ‘Ju-Ju’ Bérard of Ag2r La Mondiale arrived in early December 2014, quietly stacking in the miles while taking in a kangaroo or two along the way (according to Twitter and Instagram). Think of Bendigo as an Aussie Girona if you will. 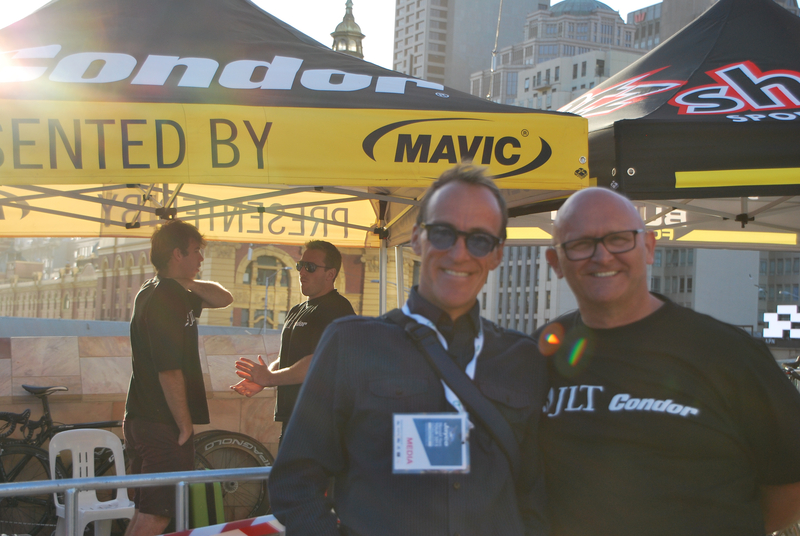 Tim Dalton and John Herety of JLT Condor at the Tour’s prologue in Melbourne City Centre. In the 2015 edition of the Herald Sun Tour, Bendigo confirms its status as cycling central Australia by hosting a finish (Stage 2) and start (Stage 3). Victoria might not have the mega climbs of the Alps or Pyrenees but the rolling terrain; grippy roads and warm 30 plus Celsius degree summer heat can take its toll. The 2015 edition started on Melbourne’s Southbank Promenade with a lung-bursting 2.1km prologue, an event that attracted over 25,000 spectators in 2014 and an even larger crowd in 2015. The evening prologue along the south bank of the Yarra River in central Melbourne from Federation Square to Queens Bridge Square is a photographer’s delight. The world’s most livable city is bathed in fading summer light with the CBD and river making a stunning backdrop. The 2.1km parcour is tough, with some early technical turns to negotiate followed by just over 1km of ‘full gas’ along the south bank. This is a prologue that’s built for spectators with the course meters from the front door step of Melbourne’s most trendy bars. The Tour then moves to regional Victoria for the longest stage, a 152km hike from Mount Macedon, past Hanging Rock, before finishing in Bendigo. Stage two was a shorter 120km route from Bendigo Velodrome, through the beautiful Heathcote-Graytown National Park and across the Goulburn River into Nagambie. The 148km stage three route showcases the Nagambie Lakes as riders loop around the Mitchelton Winery, where the stage began, before heading back to Nagambie. The final 122km stage of Arthur’s Seat is where the race is traditionally won and lost. The climb of Arthur’s Seat may only be 304 meters in height but it’s climbed from sea level, three times. The crowds rival anything seen in Europe with every meter packed with screaming Aussie tifosi. This climb is the highest point on the Mornington Peninsula and provides spectacular views from the top. On a clear day the view from the summit of this extinct prehistoric volcano extends as far as the Melbourne city skyline, the You Yangs and Mount Macedon. Melbourne’s hard-core club cyclists ride from the city, watch the race and then ride home in a gigantic, seething chain gang, a round trip of some 180kms, down the Nepean Highway. This race is a good barometer of early season form judging it by past winners. From the Herald Sun Tour’s start in 1952 up until Malcolm Elliot’s 1985 win, all winners were home grown Aussies. It took a Yorkshire man to break the Aussies’ 33-year stranglehold on the race. Past winners include hard case British Cycling Technical Director Shane Sutton OBE (1983), ably assisted by Tour de France stage winner Neil Stevens. Flying Dutch man Adri van der Poel won in 1988 with a massive attack on Mount Hotham and German breakaway specialist Udo Bolts took out the winnings in 1990. As mentioned earlier, Sir Bradley Wiggins won this event in 2009. The son of Australian track cyclist Gary Wiggins, the locals claimed this as a home win. Even my next-door neighbor, Saturday morning riding partner and local bike shop owner, Terry Hammond, has won this race twice (1978 & 1982) and finished second and third a few times. 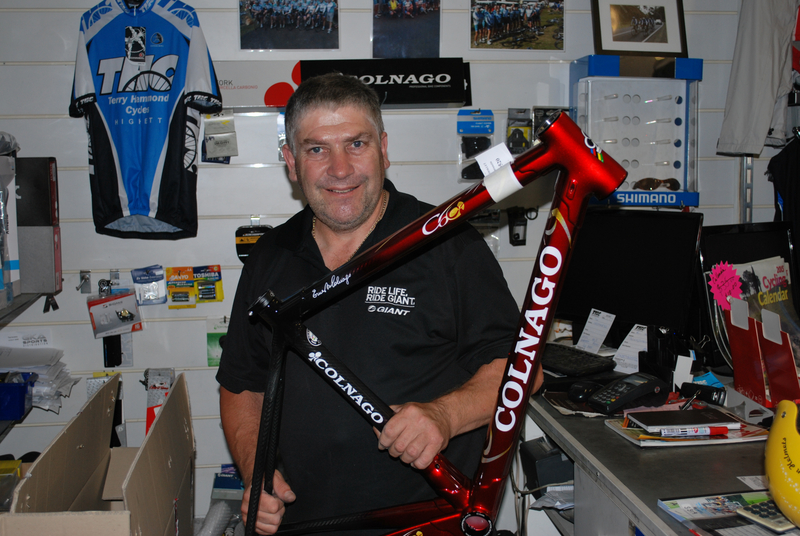 Former Herald Sun Tour winner Terry Hammond at his shop Terry Hammond Cycles with a very cool Colnago C59 frame. Terry takes great delight in reminding me that he was the 1983 National Australian Road Race Champion and that as a European professional cyclist, won many races. According to Terry the winner of the Herald Sun Tour is “a sprinter that can also climb”. Evidence of this manifests itself in the form of Barry Waddell who won a record 5 straight Herald Sun Tours from 1964 to 1968. Though best known as a road cyclist, Waddell also won 17 National track titles and the Australian National Road Race Championships in 1964 and 1968. The 2015 version of the race has attracted a fantastic field. Newly registered continental Team MTN Qhubeka are here with Aussie star Matt ‘The Boss’ Goss. Desperate to validate their wildcard entry to the 2015 Tour de France they are hungry for early season results. Team sprinter of MTN Qhubeka, Tyler Farrar, confirms that the Herald Sun Tour is far from being an exotic training race. With vital UCI points on offer for this 2.1 event everyone is racing hard for the win. With only small teams of five riders controlling the race over this deceptively lumpy course, it is extremely difficult. Farrar was keen to point out that himself and many others are here direct from a cold Northern hemisphere winter with little more than ‘base’ miles in their legs. The local Australian contingent is coming to the end of their racing season and are race fit. They also have the added incentive of prime time TV coverage, are eager to impresses potential continental teams of their ability and revel in getting one over the hot-shot European pros. DraPac Professional cycling are here with newly appointed sports director, ex-UK professional cyclist Tom Southam in the team car. After this race many of the riders will depart for Europe for the shock of spring weather and the Classics. Orica Green Edge always takes this race very seriously having won last year with Simon Clarke. The stages may be short, but with lumpy roads and hot weather, it is a hard race to win. Anyone wanting to escape the harsh northern winters could do a lot worse than de-camp to Australia for a month or so. Ride your bike; take in the Tour Down Under, Cadel Evans’ Great Ocean Road Classic and the Herald Sun Tour. The countryside is classic storybook pretty; it is dappled in light, dotted with quaint villages and bustling towns. The stunning views from the Victorian hills and big blue skies take your breath away. There is no shortage fine gastronomy here, with acre after acre of vineyards and orchards over gentle rolling hills and fields full of the prettiest cattle and sheep. Stood at the side of the road waiting for the race to pass, I have been serenaded by Galahs, Cockatoos, Rainbow Lorakeets and Rosellas. One day I even met a field full of fluffy headed alpacas. JLT Condor rider Felix English ready to give it Bigpowa on the course. A month long of Australian cycling events attracts all types of international visitors, making the 27 hour long-haul international flight bearable. This year my good friend and ex-international rider Terri Riley and her husband Brian did just that to take in all these races and more. Arriving in Australia in early November 2014 they spent the first few weeks riding the 3,064km from Adelaide to Sydney via Melbourne camping every night. I bumped into them on the climb of Mount Buninyong at the Australian National Road Race championship, then at the Tour Down Under, the Great Ocean Road Classic and finally at the Sun Herald Tour before they headed back to the UK. This reminds me of my adventure a number of years ago with my son where we loaded a beaten up old car with bikes and drove from Liverpool to Province in the south of France for the Dauphine Libré race. Our expectations where pretty low having attended the Tour de France a number of times. In actual fact the Dauphine proved to be a superb race with stunning countryside and easy access to the star riders. The lack of security staff, fencing, barriers and throngs of spectators actually provided a much better experience than the Tour de France. In a similar way the Herald Sun Tour provides a much better experience of Australian stage racing than the Tour Down Under. The Herald Sun Tour offers fantastic countryside, a low-key atmosphere but with easy access to the riders and some great racing. As they say biggest isn’t always best. So why not pack your bike bag and make your way down here to crack open a bottle of local wine, throw a shrimp on the barbie and enjoy the racing?